There´s been quite a bit of debate about this (the new AIR NEW ZEALAND livery) back at home. 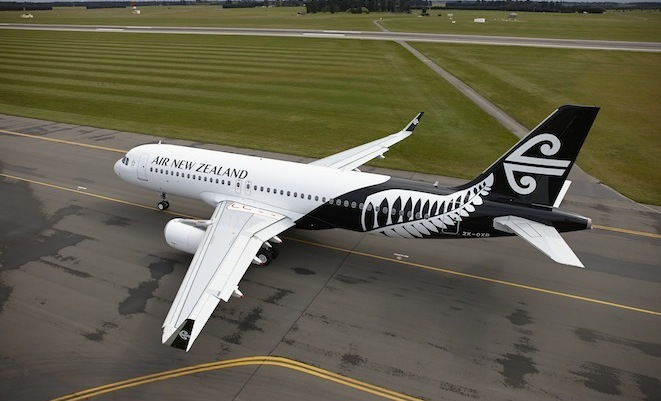 Most of us wanted to see the overall black aircraft livery with its double fern leaf (it´s a stylized representation of our Silver Fern leaf which "IS" New Zealand native flora and a national icon (as per the 2nd image above) of the country too. This particulart livery was introduced (on 1 B777-300ER, 2 A320-200´s, a BEECH 1800D, and an ATR-72) to promote the Rugby World Cup which New Zealand hosted, and won, back in late 2011, but, which "DOES", apparently, require quite difficult application process .... in fact save for subtle pressure applied by AIR NEW ZEALAND, Boeing were, initially, very reluctant to do it at all. The "pondered" option (as per the 3rd image above) has been applied to at least 2 ATR-72´s and an A320-200, but, apart from still comprising of New Zealands national colours (black and white) .... it has to be "THE MOST B-O-R-I-N-G AND UNIMAGINATIVE" airline livery ever dreamed up by a (grossly over payed) corporate mind. Consequently tgis particular idea was abandoned/dumped as a result of a change at coporate management level late last year.